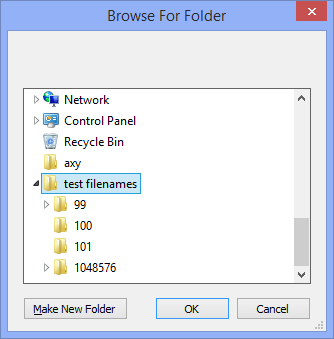 Get file names from folder. 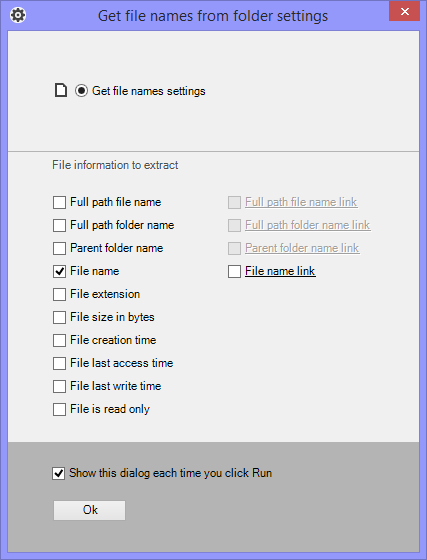 Clicking the "Get file names from folder" button get the following dialog box opened. Specify the folder path from witch you want to get the file names from. 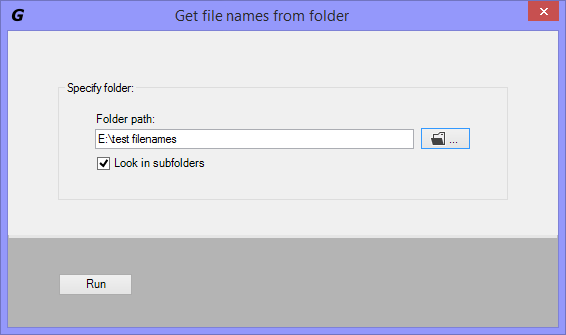 Tell the program to look for file names in subfolders. Clicking the browse folder button will open the "browse for folder" dialog box. Select the folder to export file names from and click OK.
Get the full path file name as clickable link inside Excel. Get only the folder name where the file is in. Example: myFolder. Get only the folder name where the file is in as clickable link inside Excel. Get the file name. Example: myPhoto.jpg. Get the file name as clickable link inside Excel. Get the file extention. Example: .jpg. Get the file size in bytes. This is usefull when sorting by file size. Get the date file was created. Example: 2014-08-13 2:36:35 PM. Get the date file last accessed time. Example: 2015-02-25 11:00:42 AM. Get the date file last writen time. Example: 2014-08-13 2:36:36 PM. TRUE (file is readonly), FALSE (file is not readonly).